Breakfast has long been called "the most important meal of the day." Yet, so many people leave their homes for work in the morning without having eaten breakfast. This led to a vacuum that has been filled by fast-food companies and their establishment of breakfast menus. 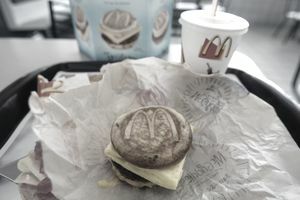 McDonald's was first, in 1972, with the establishment of a menu that included a dish of pancakes (or hotcakes, as they preferred to call them) and sausage, and a sandwich developed by Herb Peterson. Peterson was a vice president at an advertising agency aligned with McDonald's and loved eggs benedict. He and Donald Greadel, who ran a McDonald's franchise in southern California, made a sandwich out of eggs Benedict: They put slices of egg, cheese and grilled ham between halves of an English muffin, and showed it to chairman Ray Kroc. Kroc loved the idea, and the McDonald's breakfast menu soon followed. Within 20 years, McDonald's was making $5 billion a year on breakfast alone. Naturally competitive with McDonald's, Burger King tried to follow with a breakfast menu starting in 1979, but there was a snag, as their flame broilers did not have the same adaptability to breakfast items as did McDonald's grills. It took until 1983 before experimentation led to items that were compatible with their existing equipment. One was the Croissan'Wich, predating the use of croissants as sandwich bread by Dunkin Donuts and Starbucks. In 2005, Burger King introduced its Enormous Omelet Sandwich, which became their most familiar breakfast item. Kentucky Fried Chicken faced a bit of a dilemma, in that their staple, fried chicken, is generally not thought of as a breakfast food. But chickens produce eggs, and many of their breakfast items have eggs in them. In the mid-2000s, KFC had begun to test a breakfast menu in Asia, especially in Hong Kong, Singapore, and Malaysia. Through 2011, they had not yet brought their breakfast menu to North America. But, due to the nature of the association of donuts and bagels with breakfast, the leading breakfast outlets are still the leaders of fast food baked-goods in North America: Dunkin Donuts and Starbucks in America, and Tim Hortons in Canada. As Tim Hortons did not have much of a presence in the U.S. prior to the 2010s, we will focus on the other two here. Dunkin Donuts has been in business since 1950 but remained a New England regional chain until the late 1970s. They gained national notice in 1982 when they began running a series of ads featuring actor Michael Vale as Fred the Baker. Intended to show that the donuts were available and fresh 24 hours a day, Fred was always saying, "Time to make the donuts." The character proved enormously popular (as had Vale's previous character, the not nearly as nice Sam Breakstone in ads for Breakstone's dairy products), and Dunkin became a phenomenon. The same year that the Fred ads began running, Howard Schultz bought Seattle-based Starbucks and took them from the Pacific Northwest to a worldwide chain. He decided to copy European coffee houses, which were open even in early mornings, and since so many people like to have hot coffee in the morning, Starbucks became a 24-hour-a-day chain as well. Starbucks went public in 1992 and exceeded Dunkin in the number of stores and profits. The self-inflicted need to eat breakfast on the run made fast-food breakfast possible. Perhaps the next step is the opposite move: Breakfast delivered. Pizza chains such as Pizza Hut and Domino's could develop menus, possibly built around breadsticks, that could compete with the coffee-and-donut and burger chains.